Before barbecue season starts, it's a good idea to learn how to clean a gas grill. Grease, grime and food particles accumulate quickly on an outdoor gas grill. Cleaning it frequently prevents the stuff from sticking to your grill and can prevent a flare up as grease catches on fire. Before taking the time to clean your grill, read the manual or instruction booklet that came with your gas grill to make sure that there are no special instructions or warnings for your unit. Each make or model of gas grill is slightly different, and always heed any manufacturer's warnings in the manual that accompanied your grill. How to clean a gas grill can vary and always go with whatever it says in your manual over what others recommend. Mild soap, such as liquid dish washing detergent. Look for a grease cutting formula. The exterior of a gas grill is usually plain or painted metal or porcelain. Porcelain can chip like glass or ceramic, and most metals and painted surfaces will scratch. Never clean the outside of a grill with abrasive cleaner. For rusty grills, use extra care and caution.To clean the outside of the grill, close the top and any compartments underneath. Add water to the pail. Use your rag and wipe down the outside of the grill. If the water in the bucket gets dirty, empty it, rinse the pail, and refill it as many times as needed. For particularly grimy exteriors, use a few squirts of dishwashing liquid and warm water in the pail. Swish to mix, and scrub using the soft rag. Rinse all soap off with the hose. 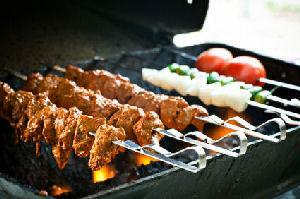 To clean the inside, which is probably the dirtiest part of the grill, remove the grilling grates and set them aside. You can wash these separately.For the inside compartment of the grill, use the soft wire brush to scrub down the inside. Make sure you get into the corners where grease can accumulate. If you look down at the sear plates of the grill, you may notice blobs of baked on material. Take the putty knife or a scraper and scrape these off. Follow up by brushing the area with the wire brush to remove any ash or baked on junk that the scraper has loosened. If the material doesn't fall to the ground under the grill, push it all towards the drip pan. Remove the drip pan and rinse it under the hose thoroughly. You should always empty the drip pan every time you use your grill so that the accumulated grease doesn't catch on fire. Lay the grates or racks out onto the lawn. Hose them down vigorously. Using the wire brush, scrub them until all the material is off. Then hose them again. Before using your grill this summer, look at the color of the gas flame. If it's burning a steady, bright blue, the burners are clear and the cooking time should be steady and even. If the flames burn orange or red, there's grease stuck around the burners and it should be cleaned. To clean the burners, follow the instructions in your manual. Always disengage the gas and purge the gas lines according to the manufacturer's directions. Since each grill is different, you'll need to follow whatever directions came with your unit to get to the burners. You'll need to remove the lava rocks though to get to the burners. That's a great opportunity to scrub them down too. You can use a commercial burner cleaner, available where you bought your grill, or mix up your own solution using water, liquid dishwashing detergent and vinegar. Mix in a gallon sized pail water to the top, about a cup of vinegar, and about a teaspoon of dishwashing liquid. You can soak the burners in this solution, rinse, dry and replace them. Lastly, check your propane canister before using your grill this summer. If the valve is loose, leaky or rusted, get a new tank. When in doubt, buy a replacement. Make sure you have enough propane in stock before you fire up the grill.